It was the worst day of his life when 16-year-old Daniel Raye walked in on a mob hit against his father. Viciously beaten and left to die, Daniel wakes up in the hospital with no vision, no memories, and no place to go. He’s put in the witness protection program by the FBI and moves to California to live with his long lost aunt, Ethyl. She runs a bio-tech firm called NanoBytes, and does everything she can to restore Daniel’s sight. Ethyl uses a drastic experimental procedure combining robotic nanites with animal and insect DNA. Not only does Daniel get his sight back, but he has X-ray vision and regains his painful memories. When the mob once again interrupts his peaceful life, Daniel uses his incredible vision to his advantage. In fact, Daniel is out for revenge. 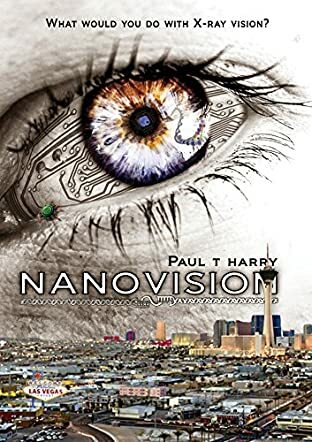 Nanovision (What Would You Do With X-Ray Vision?) by Paul Harry is a technological thriller that is quite compelling from start to finish. The premise is laced with fantasy elements, yet nano tech is already a tested and plausible field, making this story excitingly grounded at the same time. The plot is fast paced and has unpredictable twists that will delight readers. Character development is solid and relatable. I enjoy reading the familial bond between Daniel, Ethyl, and her granddaughter. While some transitions from one scene to another are somewhat sudden, the string of events is exciting and suspenseful. This is my second reading of Paul Harry’s work and it is a good read. Thank you, I'm glad you enjoyed the story!